Once the doors opened it was a first-come, first-serve mess and people were pushing, shoving and grabbing at the new items. 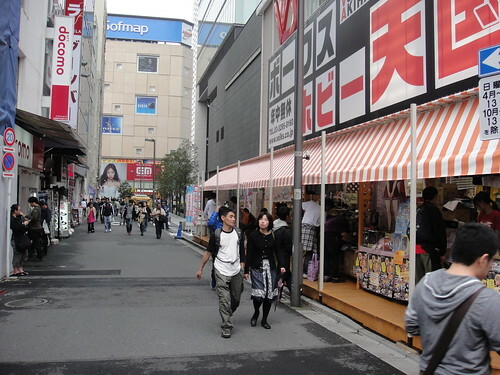 Since it was an “event day”, the bottom 2 floors were closed off for the first hr or so, with employees standing guard in the stairwells and all the customers were ushered up to the 3rd floor where the Tenshi-no-Sumika doll showroom is located. Hubby managed to get all of the new optional DD hands, the Shapely L-Bust and a couple of the new 06 heads in addition to all of the new outfits that I wanted. By the time he left all of the clothes were already sold out, but a few of the option parts and heads were still available. When we went back later that afternoon everything was cleaned out except for some shoes and some restocked maxi dresses. 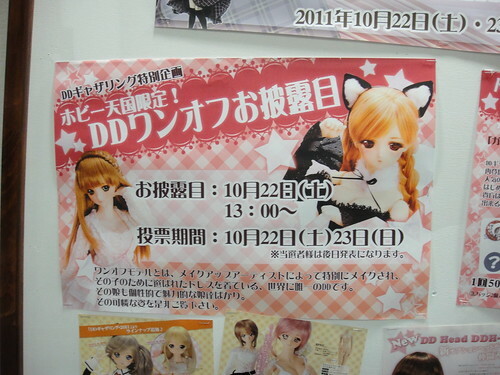 There was also a lottery event for some special One-Off Model dolls. 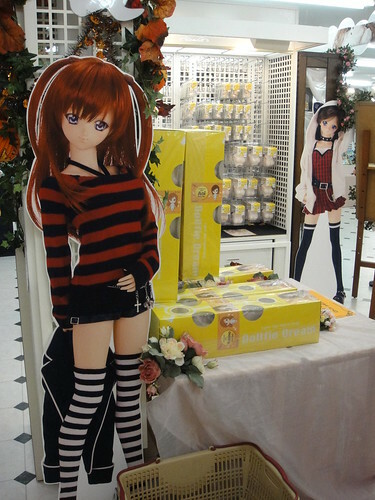 I asked about the lottery rules and was told by the manager of the store that the lottery would be open the weekend of the event, and if they drew your name they would contact you and you’d have the opportunity to buy the doll. 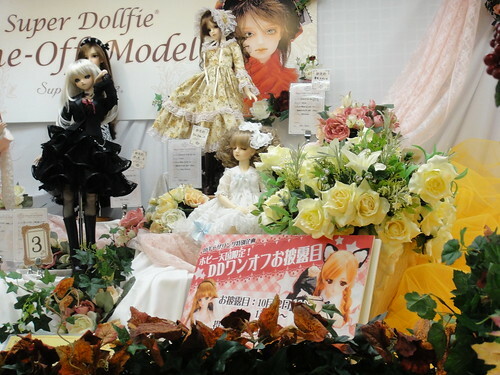 The doll would only be sent to a Japanese address – which meant that hubby and I didn’t even bother to enter since we’d be out of the country by then. Here’s a poster advertising the One-Off lottery. 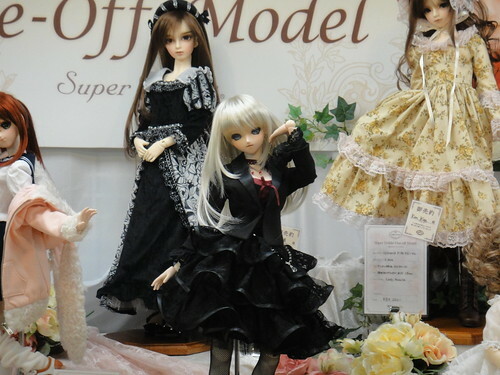 I did manage to grab a few photos of the One-Off dolls. 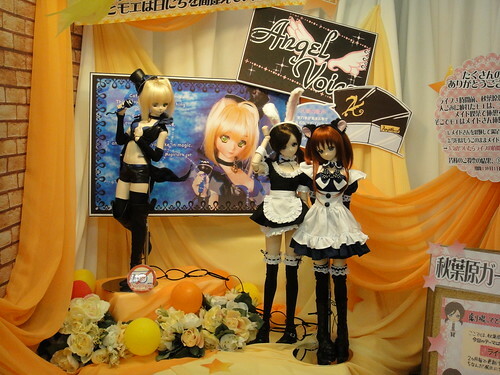 Here are Akira, Moe & Natsuki in the showroom. They are so lovely! 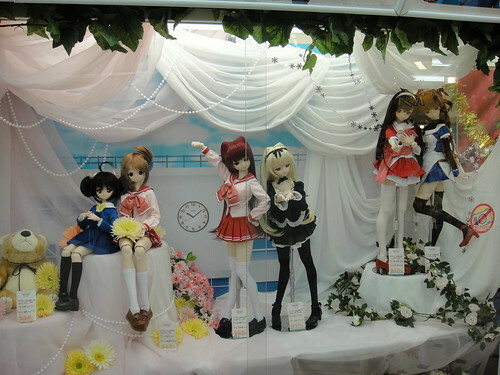 Here’s Natsuki showing off the renewal models of Aoi and Yukino, now with DDIII bodies. Here’s Alna showing off the spacious new showroom. 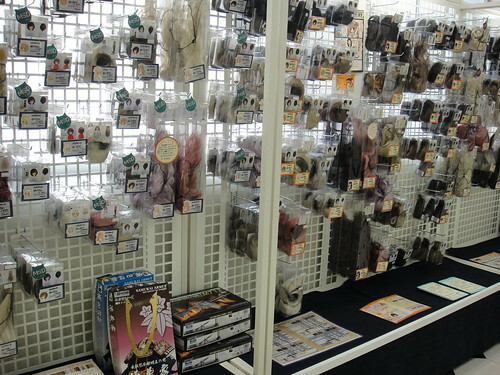 There’s a huge wall of doll wigs in this showroom and I picked up a few before my trip was over. 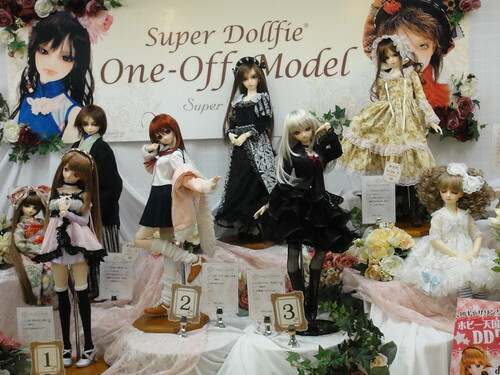 There are lots of showcases with Super Dollfie dolls and Dollfie Dreams scattered around the showroom. Here’s one with Tamaki, Sasara and the White Album girls in it. 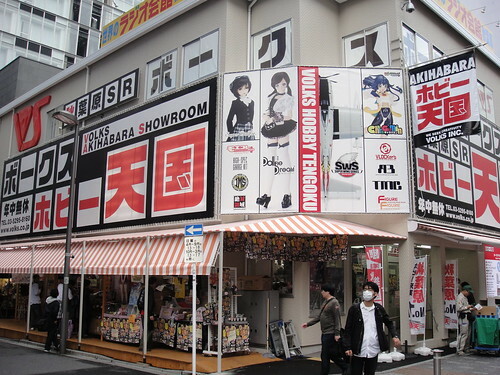 Since the Tenshi-no-Sumika is on the third floor of the new Volks building, we had to go down a stairwell to exit the store. 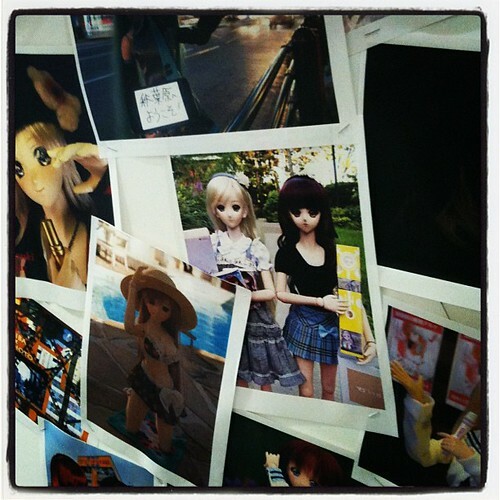 Imagine my surprise when I spotted the photo entry that Kev & I had sent in earlier for the “Akihabara” theme photo contest on display! Sugoi! As I mentioned before, I adopted a Yukino v.2. 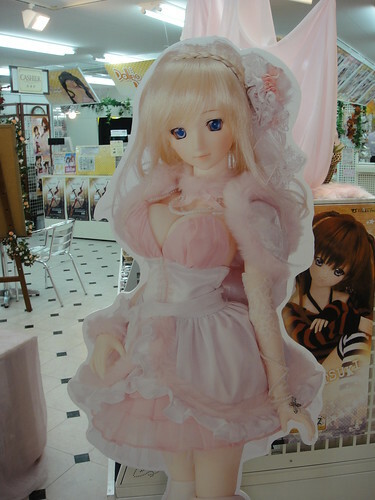 Her welcome will be a bit unusual since I opened her up in the Volks Akihabara showroom, dressed her up in one of the new outfits (and some other stuff I brought from home) and made use of the photo spaces in the showroom – so she hasn’t had a proper welcome home & box opening yet – but she’s had more camera time than most of my girls. Here’s a sneak peek at my new daughter, who I’ve named Mélisande d’Archangeli (but I’ll call her Mel or Melissa for short). 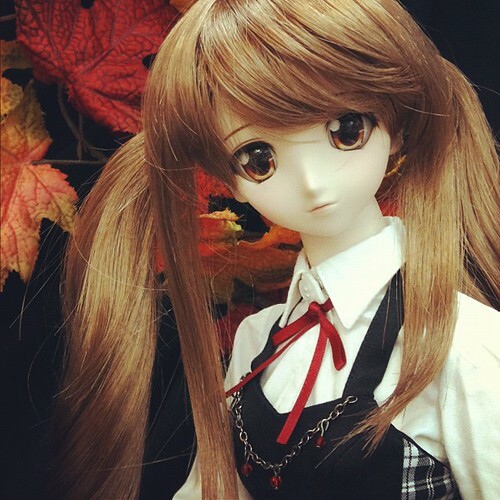 This entry was posted in Doll Meetup, Dollfie Dream and tagged Dollfie Dream, Volks, Yukino by archangeli. Bookmark the permalink.